The Craighill Channel Lower Range Front Light, named for William Price Craighill, was the first caisson lighthouse built in the Chesapeake Bay in Maryland. 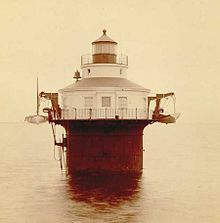 First lit in 1873, the range marks the first leg of the maintained Craighill Channel from the Chesapeake Bay at the mouth of the Patapsco River into the Baltimore harbor and works in conjunction with the Craighill Channel Lower Range Rear Light. 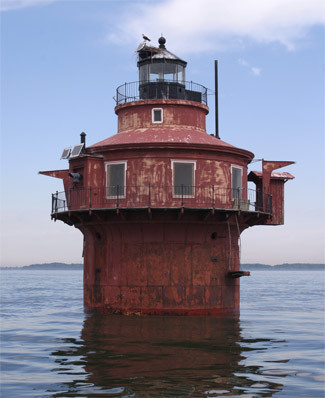 The front range light is unusual for having two lights and is the only surviving example in the Chesapeake Bay. A beacon light is fixed above the gallery deck which serves as the front light for the range and a light in the lantern serves as a general aid to navigation. The focal plane of the lantern room is thirty-nine feet, while the range light is displayed from twenty-two feet above the bay. Work on the Craighill Channel Lower Front Range Lighthouse began in 1873. Interestingly, this was only the second caisson lighthouse in the United States, with the Duxbury Lighthouse in Massachusetts being the first, in 1872. However, the Craighill Channel construction was considered much more challenging from an engineering standpoint. Following the successful completion of the Craighill Channel Lower Front Range Lighthouse, the caisson method of construction became the method of choice in areas where ice floes were a concern. While the construction of the lower front range was eventually a success, the process was more complicated than originally anticipated. When work began at the selected site, it was discovered that a solid foundation did not exist within 60 feet of the surface of the water. As a result, an additional appropriation of $25,000 had to be requested. To achieve an effective foundation for the lighthouse, ten feet of mud was removed from the channel floor, and that was just the beginning. Following the extensive dredging at the site, wooden piles were driven deep into the seabed and then sawed off at a depth of 23 feet below the surface of the water. This process required the use of a novel technique, wherein a steam operated circular saw was used underwater to cut off the tops of the piles to the required height. This circular saw was “attached to a hollow wrought-iron shaft which was held in a vertical position in a frame.” As might be expected, attempting to make blind cuts at predetermined lengths underwater was not a flawless procedure, but eventually a stable foundation was established. A caisson crib, built of hardwood and composed of four layers of one foot diameter sections of timber, was assembled at Havre de Grace, and to this were bolted the first three courses of the cast-iron cylinder, which was twenty-four feet in diameter. The first attempt to place the caisson atop the piles, made in October of 1873, was unsuccessful. However, by the end of that month, a reengineering of the ballast used to sink the caisson allowed the caisson to be successfully set in position. Of course, the purpose of any lighthouse construction is to provide a platform for a light. Thus, within three weeks of finishing the caisson foundation at the front range light, a fourth-order Fresnel lens was installed on a make-shift wooden structure that served as temporary housing for the keepers. The keepers were forced to live in the makeshift accommodations until the additional funding was obtained and the lighthouse was finally completed in early 1875. Atop the caisson foundation of the front range light, a cylindrical, one-story dwelling was constructed. The interior consisted of a kitchen, sitting room, and two bedrooms, while a privy was cantilevered from the gallery that encircled the first story. 1873, the year the light was first lit, is centered above the entrance door on the north side of the lighthouse. In the top portion of the caisson, two 500 gallon tanks were housed to store rainwater collected from the roof of the lighthouse. A wooden, circular stairway led from the dwelling space to the smaller cylindrical watchroom, which was surmounted by the ten-sided lantern. In 1899 the station received "new model fifth-order lamps." A fog bell operated by gas was established at the station in 1923. The light was changed from oil to electric on November 26, 1929. The fog signal was changed to an air whistle on October 24, 1932. In 1938 the light was described as having a Reynolds flasher to produce the one-second flash with two-second eclipse. A spare fourth-order "wick lamp" was kept as a backup. Oil was stored in a 225-gallon tank kept in the cellar. The fog signal was a number 4 Typhone Horn with an eight-inch-diameter whistle, which gave a three-second blast every 27 seconds. A backup Gamewell weight-driven clock mechanism produced a double strike every 30 seconds. The weight had to be rewound every hour and a half. The fog bell was a standard 1000-pound bell. The station had a 18-foot (5.5 m) "motor boat" and a 16-foot (4.9 m) "skiff" hung from davits. When the lighthouse was automated in May of 1964, it was one of the last lighthouses on Chesapeake Bay to lose its Coast Guard personnel. Remarkably, the Craighill Channel Lower Front Range Lighthouse has never suffered ice damage despite its exposed location. The station was abandoned on February 11, 1936 due to dangerous ice conditions, but the keepers were able to return and reactivate the lights on February 24. The exterior of the lighthouse has received regular attention, and is thus in fair condition. The interior, however, has been open to the elements and has become a residence for nesting birds. During the fall of 2002, two non-profit organizations applied to take ownership and become stewards of this historic lighthouse under the National Historic Lighthouse Preservation Act of 2000. Historical Place Preservation, Inc. was awarded a letter of recommendation by the Secretary of the Department of the Interior in July 2005 and received the keys and title to the lighthouse the following November. The organization has established a website devoted to the Craighill Channel Lower Front Lighthouse and plans to offer tours of the restored lighthouse in 2008. Currently, the lighthouse is in disrepair. It is rusted and deteriorating, but still has an automated flashing beacon. “Craighill Channel Lower Range Front Light Station’s National Register of Historic Places Nomination,” 2002.